The hot tub cover is a vital component of your spa. Not only does it provide a safety feature, it also prevents heat from escaping, keeps bugs and other critters out of the water and protects the surfaces from fading. Covers are very costly to replace, so taking care of them now will help to save money in the coming years. Here are some tips to help keep your hot tub cover in great shape. Good, clean water isn’t just important for you and your guests, it’s also important for your hot tub. If the water is too acidic, it can eat the material along the lower side of the hot tub cover. It’s important to chlorinate or “shock” the water to maintain its clarity, but you should open the cover for an hour afterward to let the fumes evaporate without damaging the cover. The heavy covers make an appealing seat for kids and friends alike, but sitting on it can quickly harm your cover. Too much weight on the cover can break the foam core and lead to sagging. This causes water to pool on the cover and leads to more cracking and deterioration. If you want the cover to last, make sure to only use it as it was intended. Hot tubs now come with special stands and lifts that make it easy to remove the cover. Without these lifts, you may wind up heaving the cover as you try to get it on and off the spa. This leads to torn seams and fabric. A cover lifter will cost a little more, but it will help you save a great deal in the long run. If you leave debris, like soggy leaves and dirt, sitting on your cover, it can deteriorate and stain. This debris works to trap the water and soil in place, and that speeds up the damage. Protect your hot tub cover by keeping it free of dirt and debris as much as possible. You can also add a layer of protection by using 303® Aerospace Protectant™, which will help repel dirt, dust, and soil making clean up a breeze. 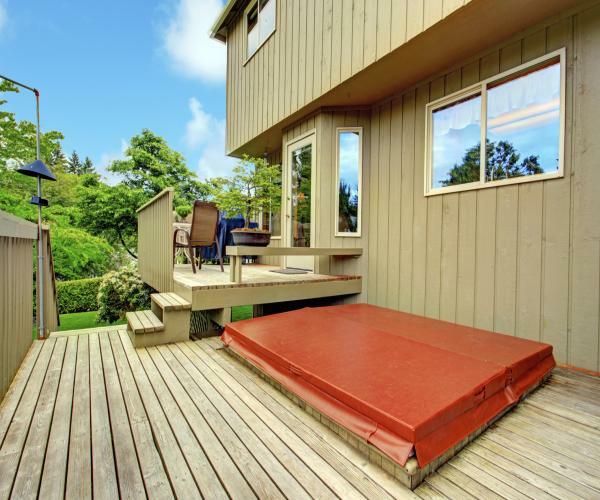 Rain and weight aren’t the only threats to your hot tub cover. You also need to keep it safe from UVA and UVB rays. A product like 303 Aerospace Protectant is ideal for adding another layer to the material, keeping it protected. This prevents dry rot, cracking and fading and will leave you with a matte, non-greasy finish.